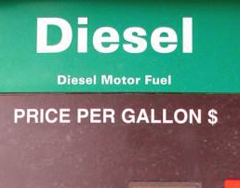 Wisconsin school districts feel the pinch of $4.00 per gallon diesel fuel. Superintendents at Granton and Neillsville schools say their transportation budgets are tight this year. Granton has four buses; Neillsville has just over 20. Neillsville superintendent John Gaier says last January, the school paid about $2.26 per gallon; this January, the price is up to $3.36 and going up. Granton &apos;s Rick Rehm says their fleet gets between 5 to 7 miles per gallon, so the district has been trying to utilize a smaller, gasoline fueled bus for extra trips. Schools don&apos;t pay federal taxes on diesek fuel and there&apos;s a proposal to eliminate the state gas tax, too.